Can you help Rantz craft some Ogre Arrows and use them to kill a Chompy Bird to feed his children? 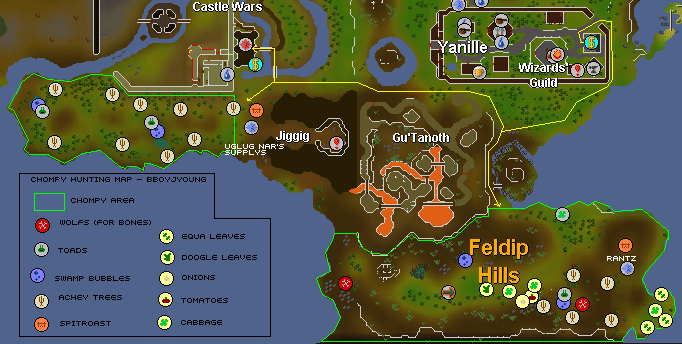 If you are looking for the modern RuneScape guide for this content, please see our Big Chompy Bird Hunting guide. Rantz the ogre needs to feed his demanding children, Fycie and Bugs, so he wants to go Big Chompy Bird hunting. Problem is, he's all fingers and thumbs when it comes to making ogre arrows. Begin by talking to Rantz, just east of Gu'Tanoth. Firstly, talk to Rantz, an Ogre living a short distance east of Gu'Tanoth, also known as Ogre City which is located just south of Yanille. He needs some help catching a Chompy Bird, so tell him you'll make him some "stabbers" so that he can catch one. He'll tell you that you need wood from the Achey Trees, as well as Wolf Bones to make them. Now, chop down enough of the nearby Achey Trees to make around 15 arrows. After Fletching the logs into arrow shafts and adding the feathers, head west to kill some of the level 64 Wolves and collect their bones (lower-level Wolves around White Wolf Mountain will also give Wolf Bones). Use your chisel with the bones to make Wolfbone Arrowtips, and then add them to your flighted arrows. Bring the arrows back to Rantz, who will take 6 of them for himself. Now he needs you to get a "Fatsy Toady" to lure the Chompy Bird, but make sure you ask him all about the toads before you continue. Head north and go inside of the cave and talk to one of the kids who says that they inflate the toads with swamp gas. Open the chest in the northwest corner and search it to find and Ogre Bellows . Head to the swamp to the southwest and use the bellows with the Swamp Bubble to fill it with swamp gas. Now use it with a toad to inflate it, and do the same for 2 others (you can only hold 3 at a time). Bring this back to Rantz who tells you to place it in the clearing. Drop it under the arrow and talk to him again. He'll miss the Chompy, so talk to him again and he blames it on your arrows. Ask to give it a try and he'll give you an Ogre Bow. Drop another toad in the clearing, wait for a Chompy Bird to appear and attack it! Pluck the bird, and then take the meat back to Rantz who now wants you to cook it with seasoning. Cabbage - Grows north of the Onion & Tomato respawn and southeast of Rantz. Doogle Leaf - Respawns northwest of the Onion respawn. Equa Leaves - These respawn southeast of Rantz on a small peninsula. Onion - These grow just west of the swamp. Potato - These grow southeast of Rantz. Tomato - These respawn on the stool west of the swamp. With the meat and seasonings in your backpack, use the Chompy Bird meat with the Ogre Spit north of Rantz, and then bring it to him to finish the quest. Ogre Bow 1,470 Cooking experience 735 Ranging experience 262 Fletching experience Ability to hunt for Chompy Birds and get free Chompy Hats from Rantz. 1,470 Cooking, 262 Fletching and 735 Ranging experience. The ability to hunt for Chompy Birds and get free Chompy Hats from Rantz.